Review and update all agreements with employees and contractors which reference confidentiality to ensure that appropriate language is included in all of such agreements going forward. Create a DTSA policy document to be given to every employee and contractor with every contract which references confidentiality. Require all suppliers, vendors, and any other contractors whose employees have access to trade secrets or confidential information to provide appropriate notice to their employees. Verify compliance with the DTSA notice requirements by having counsel review all standard contracts and company policy documents to make sure they contain the required language. The DTSA does not preempt states’ trade secret laws; those state laws remain in effect. Accordingly, there is no requirement that a party even allege a DTSA claim when pursuing a trade secret action. Strategic consideration must be given to bringing a DTSA claim and the impact on jurisdiction. A plaintiff that prefers litigating in state court may wish to forego adding a DTSA cause of action to the lawsuit because doing so would create a federal question. If a state court lawsuit alleges a DTSA claim, the defendant may remove the case to federal court. Remedies under the DTSA include damages for the loss caused by the misappropriation, damages for unjust enrichment, and injunctive relief for any actual or threatened misappropriation. If a plaintiff can establish that the trade secret was “willfully and maliciously appropriated,” the court can award exemplary damages of up to two times the amount of actual damages. For bringing a claim, reasonable attorney’s fees may also be awarded to the prevailing party, as well as to a defendant if the claim of misappropriation is made in bad faith. Once an afterthought, trade secrets were the last of the four major types of IP—patent, copyright, trademark, and trade secret—recognized by the courts, and the basic elements of the tort of trade secret misappropriation have been recognized since only the late 1800s and early 1900s.¹ However, as we reported here, the number of trade theft continues to rise, and by one metric, doubled between 1995 and 2004. Until now, trade secrets were the only major type of intellectual property not backed by U.S. federal civil remedies to compensate owners for theft. Does Your Business Need a Trade Secret Audit? A trade secret audit evaluates and reports on the status of your business’ trade secrets. A trade secret audit outlines considerations relevant to your ability to secure, protect and enforce your trade secrets and, if desired, provides an appraisal of the value of these trade secrets. Does your business rely on information that is not readily known to others and that provides a business advantage over your competitors and do you require a confidential disclosure agreement to be signed to see such information? Does your business have and maintain a trade secret program? Does your business monitor terminated employees, the single largest reason trade secrets are lost? Does your business permit others to examine and use your trade secrets, do you require a use license and do you have copies of these agreements? Does your business use trade secretsof others and do you require maintenance of these outside trade secrets? Do you have copies of authorizations to examine and use the trade secrets of others? Your answers to these questions will indicate if it is time to contact an IP audit specialist to ask about a trade secret audit. On April 22, the California Court of Appeal, Sixth Appellate District, held that the use of trade secrets warrants damages equal to the license price, not the purchase price. Grail Semiconductor, Inc. invented a new, faster microchip. The chip used induction to collect electric charges and accelerate computer processes. Grail discussed the induction technology in 2001 with Mitsubishi Electric, Inc. Mitsubishi signed a nondisclosure agreement and attended a presentation, but refused to invest. Mitsubishi’s subsidiary then began to manufacture products with the same inductive design only three years later. Damages for the breach of a nondisclosure agreement typically reflect the stolen property’s value. “Value,” however, is a vague term. It might mean 1) purchase price; 2) projected royalties; or 3) actual profits. The jury defined “value” as the purchase price. It awarded around $123 million, the amount for which Grail could sell the technology. Its calculations reflected projected profits in Grail’s business plan. However, the jury’s calculation method was not valid. The appellate court held in Grail Semiconductor Inc. v. Mitsubishi Electric & Electronics USA, Inc., case number 1-07-CV098590, that damages should reflect the price to license the product, not purchase it. Mainly, Grail could lease the technology to other companies, despite the misappropriation. The technology, therefore, retained most of its value; Grail and Mitsubishi were the only two companies that knew it. Furthermore, the court refused to grant a JNOV as Mitsubishi was still liable – it just owed less money. It also said that damages were a sufficient remedy, though the nondisclosure agreement required an injunction. Ultimately, it ordered a new trial so a different jury could correctly compute damages. Consequently, the improper use of trade secrets may warrant fewer damages than disclosure. Plaintiffs who sue for the illicit use of trade secrets may need to consider accepting lower settlement offers. They might also want to describe a marketing strategy for which mere use of a trade secret completely impairs its value. Trade secret theft is illegal and commonplace. 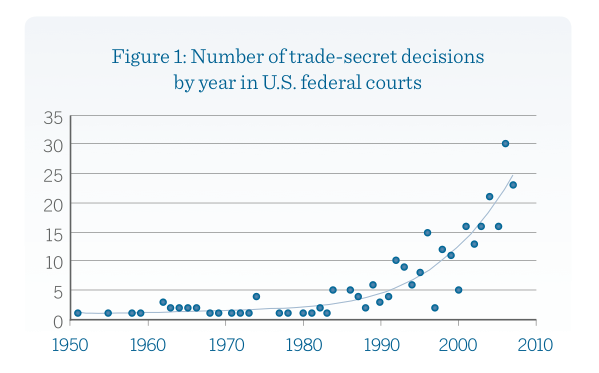 A 2010 report found the number of trade theft cases in federal court doubled between 1988 and 1998, and doubled again between 1995 and 2004. Establish an internal trade secrets program and identify who is charged with ensuring compliance (e.g. chief security officer or general counsel). What the company considers confidential should not be a mystery to the corporate officers and should be clearly and repeatedly communicated to employees. Strictly limit access to the confidential materials as necessary to perform job functions. Consider which trade secrets really need to be transferred to suppliers. As the CREATe report notes, segmenting a manufacturing process across multiple suppliers is one way to ensure the company’s intellectual property is not concentrated in one place for thieves to steal. Does the supplier have a reputation for intellectual property rights violations, trade complaints or export control issues? Has anyone asked? Verify that the supplier had implemented nondisclosure agreements with its employees and consultants. Outsourcing may reduce costs, but without thorough due diligence, the corporation exposes itself to unknown risk. If you don’t ask, you don’t get. Review the contractual requirements to ensure favorable terms from the supplier necessary to safeguard the company’s intellectual property. This may include clear language identifying the confidential material, prohibitions on wrongful disclosure, auditing rights, further assurances, and return of material on termination of the contract. 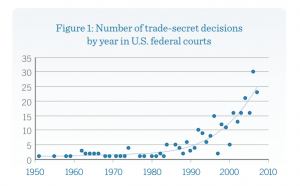 For jurisdictions with weak laws on trade secret misappropriation, arbitration may be a preferable contractual remedy for a dispute. Limit the supplier’s ability to subcontract and/or retain the right to inspect or refuse the supplier’s subcontractors. Building an internal culture of compliance communicates the value of the company’s intellectual property assets to employees who will interact with your supply chain vendors. With favorable contractual terms permitting inspection and auditing rights of the supply chain vendor, budget for period audits and exercise those rights. A vendor may not tell you about a data breach affecting your trade secret unless your contract requires it, and you may never know if you don’t inspect. Review of the vendor’s compliance with the strong contractual protections is necessary to identify any problems. Departing employees should be reminded of their nondisclosure agreement obligations. Return of company materials and electronic access rights must be rigidly and timely enforced. Where appropriate, it may be prudent to advise a competitor who has hired an ex-employee of the ongoing duty not to disclose the company’s trade secrets.